I don’t often go to Duleek. There is little in the course of my daily life that would take me to the neat little village in County Meath. 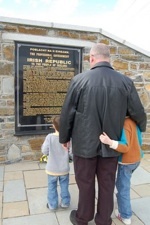 On the previous occasion I had been there it was for the unveiling of the hunger strike monument last June. It is a work of considerable craftsmanship situated less than half a kilometre from the main street. It is the property of the Duleek 1916-1981 Monument Committee. Today it was the site of the Easter commemoration. The Monument Committee, organisers of today’s event, is an independent republican cultural body which dedicates itself to the politics of memory with a specific focus on all Irish hunger strikers who lost their lives in the course of struggling against the British. Every Easter Sunday I try to attend one of the events. On occasion I end up at commemorations organised by groups I have little in common with other than a shared desire to pay tribute to fallen comrades plus the fact that we are republicans not traitors. I don’t mind who organises it. It would be dishonest of me to say I would attend a Sinn Féin event; for the same reason that when Sinn Féin was still a republican body and I was a member it would never have occurred to me to attend an Easter commemoration organised by the Workers Party or Fianna Fail. Now that it is in name a republican bank, but with absolutely no republican assets, coupled with the party openly calling on people to become touts the gap between me and it is 180 degrees. This afternoon, I travelled with my wife and two children over to Duleek village green. It was a beautiful day and the children joined with others of their age in romping around the green. Playing not politics is what captures their imaginations; although they do like the noise of the band. That reminded me of the wisdom of the old Chinese proverb ‘if your neighbour annoys you buy each of his children a drum.’ By the time we arrived the band had already assembled and it wasn’t long before we moved off along the main street then turning left to make our way up to the monument. I estimated the crowd to be about 200 strong. The ubiquitous Garda presence prowled on the fringes without ever becoming intrusive. What I liked about it was that there was no standing on ceremony. As soon as we arrived at the monument it was down to business. The wreaths were laid, the proclamation read, and flags lowered as a minute’s silence was observed. The one dissenting voice from the silence was the noisy howling of my three year old. He had either lost his toy car or had been upset by his sister in some way so he decided to protest in the way that three year olds do. No one other than me seemed bothered. The main speech was delivered and with the playing of the national anthem complete the assembly began to disperse. ‘Traitors’ featured in much of the discourse both from the speakers and amongst the crowd. The redoubtable Breandan Mac Cionnaith of Garvaghy Road prominence was the main speaker and he hit out at Martin McGuinness’s use of the term against republicans who refuse to back him in his political career as a British micro minister. Some in the crowd including myself would jokingly address each other as ‘fellow traitor.’ Breandan Mac Cionnaith delivered a radical address which left little room for misinterpretation. Those operating partitionist institutions north and south had failed the people of the country, the ideals of the 1916 proclamation had not been achieved anywhere and no matter how dispirited people were republicanism would come again. I try not to be an emotional republican. Emotion always distorts reason which ultimately is what should guide us through life. But it is difficult not to feel a surge of emotion racing through the veins when reflecting in those situations on what the men and women of 1916 gave up in order to make a stand against a malign foreign power which had long subverted Irish independence for no end other than its own. After proceedings had come to a close we spent a few moments chatting to Breandan Mac Cionnaith and some of those behind the event. Mac Cionnaith has battled long and hard in his adult political life and we wished him well for the future as he tries to salvage something from the wreckage of republicanism. The organisers thanked us for coming. We in turn thanked them for having built a monument so fine that it made the visit an honour; we felt privileged to stand beside it. Before making the journey back to our home we had some family photos taken at the monument. Whether our children grow up to acquire republican perspectives is a matter for them. As their parents we just glad that that they can share moments that are special for us.